Schedule classes. Record drives. Track Payments. Grow your business with the premier companion app for driver ed instructors. 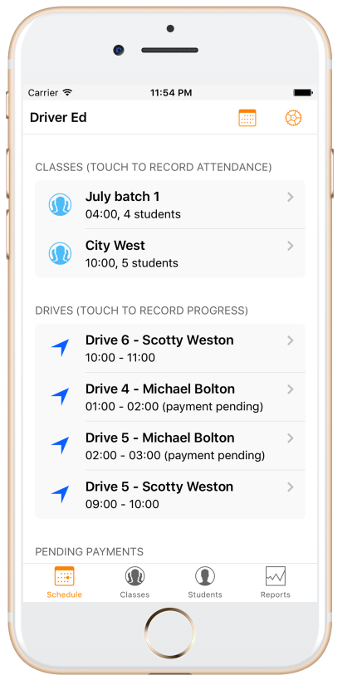 Never miss another drive with push reminders sent 10 minutes prior to every scheduled class or drive. Scheduled class dates are automatically assigned to students when they are added to the class. Schedule up to 6 drives, record over forty student progress checkpoints, and track payments. Automatically keep track of students yet to pay for classes or drives. Print class record sheets and student progress sheets directly from your phone or tablet device. Visualize stats and quick summaries of student progress, completion, and much more.